WWE has announced that Chris Jericho will replace Rusev at the upcoming Greatest Royal Rumble event on April 27 to face The Undertaker in a casket match. 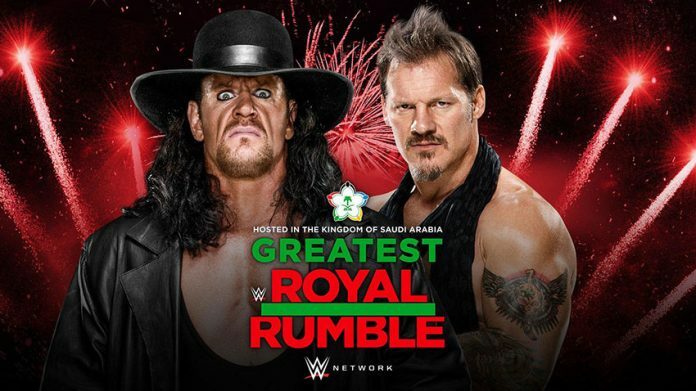 In a stunning turn of events, The Undertaker will battle Chris Jericho in a Casket Match at the Greatest Royal Rumble event in Saudi Arabia on Friday, April 27. Originally, the Casket Match was to be between The Deadman and Rusev. However, Lana, who originally showed public support for her husband competing against The Undertaker, recently tweeted second thoughts over The Bulgarian Brute competing in the grisly bout. The Casket Match undoubtedly belongs to The Undertaker, as The Demon of Death Valley has claimed victory in several of these harrowing contests, wherein a Superstar only wins when he gets his opponent into the casket and closes the lid. Although Jericho has never been a part of such an ominous showdown, WWE’s first Undisputed Champion has battled in virtually every other kind of match WWE has to offer, and if his extensive résumé says anything, it’s that he knows how to win when it counts. The Deadman and Y2J are no strangers to one another. They have competed side-by-side, including the epic Team WWE vs. Team Alliance Match at Survivor Series 2001, as well as against each other, including the Elimination Chamber Match in 2010 where Jericho overcame The Phenom to capture the World Heavyweight Championship. Which of the two iconic Superstars will walk out, and which will be carried out in a casket? Find out at the Greatest Royal Rumble event, Friday, April 27, at 7 p.m. AST. The event streams live on the award-winning WWE Network with a tune-in time of 12 p.m. ET/9 a.m. PT, and with a special, one-hour Greatest Royal Rumble Kickoff starting at 11 a.m. ET/8 a.m. PT. It will be available on pay-per-view outside of the Middle East with regional broadcast information forthcoming, and tickets will be available Friday, April 13. This announcement comes just a day after WWE has previously announced Rusev would be facing Undertaker in the match in two weeks from Saudi Arabia. WWE did not clarify if Jericho will still take part in the 50 Man Greatest Royal Rumble match the same night. Jericho was added to the Rumble match along with RAW General Manager Kurt Angle and 13 other new names in an announcement on Tuesday.